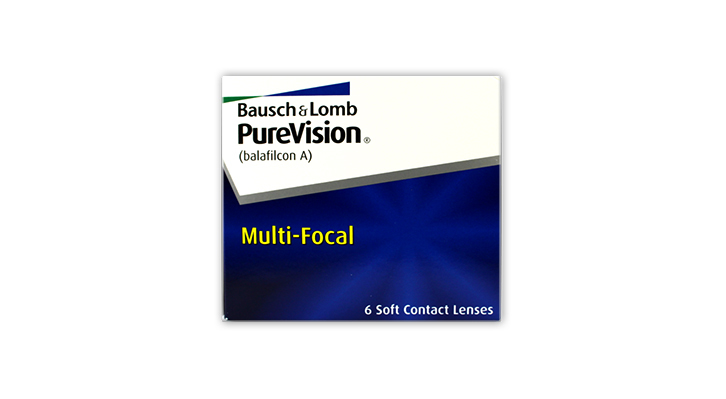 Purevision Multifocal soft Contact Lenses are designed to give you sharp, vibrant vision at every distance without reading glasses, bifocals or varifocals. If your having trouble reading things up close and holding small print at arms length for a clearer focus, it`s likely that you are experiencing presbyopia - a naturally occuring condition that affects most people startingin their 40s. But don`t worry, just because you have presbyopia doesn`t mean you need reading glasses or bifocals. With Bausch & Lomb Purevision Multifocal contact lenses, you will be able to see clearly at all distances - near, far and everything in-between. Purevision MultiFocal contact lenses are also made of a unique material that lets natural levels of oxygen to reach your eyes so that they stay comfortable and healthy.The lenses are also designed to resist protein and debris build up. This means your lenses stay clean. The lens can be worn on a daily basis (removing and cleaning/storing it at night) or continuously (sleeping in them) for 30 days and 29 nights. This means that you can now wear the lens throughout the night and wake up with excellent visual performance in the morning. These work for me (and I'm picky). I don't like getting old and ending up needing two pairs of different glasses, because for forty-five years I didn't need any at all. I don't like glasses because I want to see the world, not the frames. I don't like contact lenses which dry up and die in the early evening. I don't like contacts which pull my eye out of shape if I wear them all day, every day, for more than three days. I hate contacts which always seem to be inside out and/or blurred and/or giving double vision. I don't like sticking my fingers in my eyes every morning and evening. I don't like nightly faffing with cleaning solutions. All sorted by these lenses. They work. Near, far, wherever I look, they just work, with a little bit of "routine maintenance" only. Well worth the price, excellent, and just the ticket for this lazy, picky old geezer with dodgy eyesight. I've worn continuous wear lenses for many years and have had no problems at all until my sight started to further deteriorate. The optician offered me reading glasses to wear on top of my normal lenses... swift change of opticians and the chance to try these. They did take a bit of getting used to, but i'm happy to say that these are liberating. I no longer need reading glasses (thankfully) and my near and distance sight is great. Add to that the fact that these are continuous wear lenses, and this particular blind bat is a very happy customer. I do like these, really. 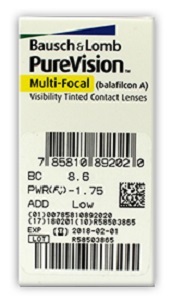 It's just that having worn Purevision extended-wear lenses for six years non-stop and then these vari-focals for six months, I find there is a trade-off on long distance clarity. Occasionally I have swapped to daily softlenses and find that long distance focus is better. These do not seem to have the same crystal clarity that the non-vari-focals have. Still a great product though; the most comfortable lenses I have used. They have transformed my life in terms of lens-care. I just flip them out once a week on average for a swift clean or overnight soak to rest my eyes. Had a trial of these with my optician and was offered a box of 6 for £81! Nice saving only paying £43 and they are super for me, I have really dry eyes that normally sting and water on an evening and they've helped that and good vision and can read too! Distance vision slightly worse than glasses with these but just a little worth it for all the other benefits! I take them out every night at advice of optician due to dry eyes, high chance of infections leaving them in!